The idea of starting a youth group can be daunting but it can also be a rewarding project to embark on. It can make a positive impact on young peoples' lives and provide an opportunity for local people to make a difference in their own communities. For any youth group or project to run smoothly it is essential that everyone in the team works together with a clear understanding of the purpose and objectives and an awareness of important issues like programming, group management and health and safety. Youth Scotland has produced this online resource to help you, as a volunteer or voluntary group, to understand these responsibilities and issues. The menu on the left provides useful information and downloads to guide you through the process of Getting Started. Finally, you don't have to do it on your own. Youth Scotland is the network of youth groups in Scotland offering a range of training, information, support and guidance for people like you. 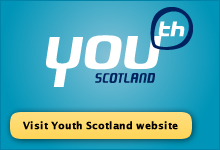 Find out more about becoming a member of Youth Scotland here. Good luck in your endeavour, and remember, running a youth group can be great fun. Youth Scotland would like to acknowledge resources produced by Essex County Council (2003) as a key reference for developing the material in this guide.